If you're rocking an iOS device and you're ready to have some fun at your next party, then you definitely need to check out our selections for the best DJ apps for iPhones and iPads. When it comes to DJ or music-making apps, Apple's and iPhones and iPads have always been ahead of the pack thanks to a combination of two tightly connected factors: latency and developer support. Historically, iOS devices have always offered minimal sound latency, which meant that iOS apps can seemingly instantaneously output audio when the system dictates it to. Modern iPhones and iPads usually have sound latencies measured somewhere between 7 and 10 milliseconds. Up until Android 6.0 Marshmallow, the sound latency of devices running Google's mobile OS was somewhere in the 100ms range. Since iOS has historically allowed developers to create pro-audio apps, Android has yet to become the go-to platform for any quality-focused music-making mobile app, and this for reasons that only go on top of the usual ones such as performance inconsistency across devices and fragmentation. Now that we've explained why we've limited our picks to iOS apps, let's talk about the best DJ apps for iPhones and iPads! 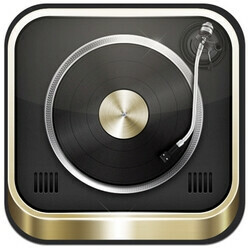 Djay 2 is probably the most popular DJ app among iOS deejays, and this for good reason. Pretty much every function available on computer-class DJ software is available in Djay 2 with minimal latency and smooth performance. In terms of song libraries, the app integrates with both iTunes and Spotify. Djay 2 features a classic two-deck setup, EQs for each deck, as well as a number of sound effects (some of them available as in-app purchases). Other functions include a sampler pad that allows you to overlay sounds on top of your tracks, BPM and key detection, as well as a song-matching feature that automatically comes up with song suggestions based on your current playlist. If you're looking for the ultimate iOS DJ-ing experience, then Djay Pro is probably what you're looking for. The enhanced version of the app, which is only compatible with the Apple iPad Pro, is the only DJ app for iOS that can mix up to four songs and two 4K videos simultaneously, for the complete multimedia deejaying package. Unfortunately, the price of $19.99 is prohibitive for most users. In the world of DJing apps, Traktor is one of the most popular solutions for Windows and Mac, and the company's iOS app, which works on both iPhones and iPads, expands the experience to Apple's mobile devices. If you've ever used Traktor on a computer, then you're already familiarized with the workflow, although there are some differences that you should take note of. Traktor for iOS comes with all of the sound effects available on the desktop version, but the number of decks is limited to two, not four like on the desktop version. Unfortunately, the app can only load songs from iTunes library, meaning that you should be looking elsewhere for integration with Spotify or Soundcloud. Cross is a very straightforward deejaying app for iOS that's built around the basic setup of two decks on the side and a mixer with EQ in the middle. Cross DJ comes with a looping function that's easy to use but very effective, and many users appreciate the accuracy of the cue points. Cross DJ also offers Soundcloud integration, which can be a major advantage, depending on the type of music you're planning to mix. If you want to mix songs that you've uploaded or favorited on Soundcloud, then Cross DJ is definitely the first DJ app for iOS that you should try out. The free version of Cross DJ only comes with a couple of effects (flanger and echo), but you can get additional sound-shaping functions through in-app purchases. Serato, which is another popular software used by professional DJs, also comes in a mobile flavor for Apple's iPhones and iPads. Unlike Traktor, however, which offers a nearly equivalent mobile app, Serato's iOS app adopts a different approach. The Serato Pyro app, which has only been around since February 2016, will automatically mix your favorite songs. Using a combination of techniques, the app can automatically blend one song into another, and will seamlessly do so even if the tempo of two successive songs are significantly different. You can use either your iTunes library or your Spotify account. Aside from the ability to reorder the songs in a playlist, Serato Pyro doesn't really offer too many options. As such, the app isn't one we can recommend to would-be DJs. On the other hand, if you just want to be in control of the playlist while making sure that song transitions don't kill the vibe, then Serato Pyro is just what the doctor order. If you don't need a fully-fledged DJ app but you're also looking for something a bit more complex than the Serato Pyro, then Pacemaker is the DJ app you should be using. Like Serato Pyro, Pacemaker can automatically mix songs selected from either iTunes or Spotify. However, Peacemaker also offers a three-band equalizer (which can prove to be indispensable on certain sound systems and in certain environments). Furthermore, the paid version also allows you to apply sound effects to the songs, such as Hi-Lo, Reverb, ChopChop, 8-bit, Roll, Echo, Loop, and Beatskip.